This Guide offers the visitor an overview of the Oatka Creek: general information, history, and how to find special features. Photographs of historic and scenic sites are included that show interesting features along the Creek, some as they appeared a century ago or longer. 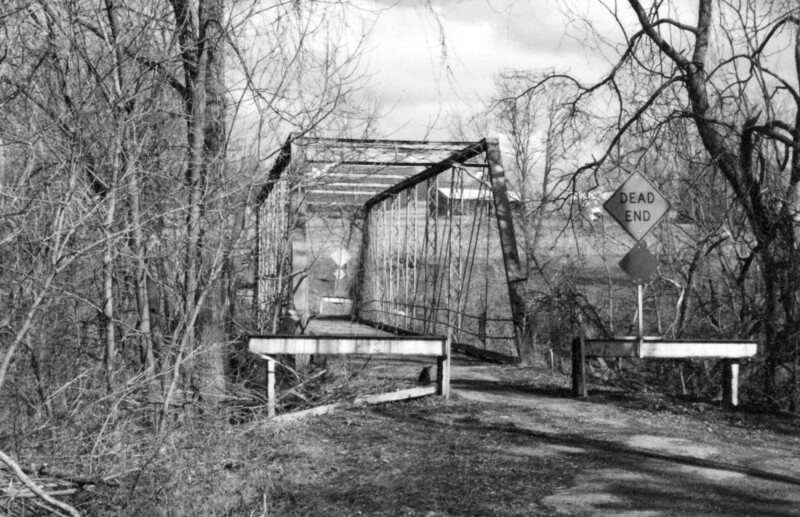 If one starts in Scottsville, where the Oatka Creek joins the Genesee River, and travels upstream, one would follow the trail of the early settlers who moved along the creek valley and settled nearby lands. Although short stretches of the creekbank are public and access is provided to fishermen, hikers and other outdoor enthusiasts, most of the land bordering the Creek is privately owned. The water of the Creek itself is public, but there are many obstacles to traveling the length of the Creek by foot or canoe. To visit the Oatka, one can walk, bike or drive along public roads and find access at crossings, at negotiated lengths, or at overlooks. The Oatka Creek experiences flow separation during summer and part of the fall. During the dry season (summer-fall) the creek is a losing stream; it loses water to the ground for a period of time. The water then reappears as seeps and springs between Buttermilk Falls and the Circular Hill Road Bridge. During these dry periods the creek can be divided into upper and lower watersheds. The upper watershed is from Rock Glen to the eastward bend in the Oatka Creek north of the Village of LeRoy and the lower watershed from the bend to Scottsville. During the wetter periods Oatka Creek flows continuously over its creek bed. With the northward glacial withdrawal 12,000 years ago, much of the current Oatka Creek watershed land-scape was formed: valleys, hills, drumlins, escarpments, and bodies of water, watercourses and waterfalls. Over much of the emerging land, trees formed vast forests. The Seneca developed villages in clearings near water, and trails for transportation, hunting, and for conducting hostile expeditions. Some Indian trails were adopted by later settlers and became major roads such as New York State Route 5. Subsequent to glacial retreat and the formation of north-south hills and valleys, water flowing off the hills carried away topsoil and produced deep fertile valley soils. Underlying much of the watershed soil are shales and sandstone of varying thickness. Valleys and northern slopes are a mixture of alluvial deposits and glacial gravel, producing well-drained, fertile and highly productive soils. In some locations, soils containing small particles produce heavy clay. North of LeRoy, the Onondaga escarpment, a unique east-west geological formation, yielded hard flint-like materials for Indian weapons. 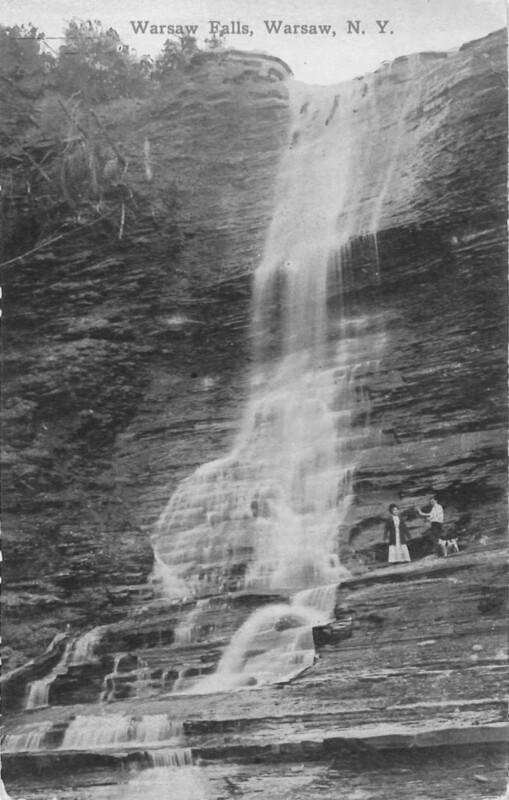 It also is the site of “Buttermilk Falls” (Figure 1, courtesy of LeRoy Historical Society) where the Oatka Creek drops abruptly 60 feet before turning eastward. Below Buttermilk Falls, the bedrock is predominately Onondaga Limestone to the south, tending to Akron dolomite and Camillus shale to the north. Overlying soils are mainly limestone-derived loams to the west, tending towards sandy loams to the east, interspersed with areas of muck. The buffering action of the limestone underlying the stream and its major tributary, Spring Creek, and surrounding lands, contributes greatly to the water quality of the lower stream. In central Wyoming County, the eastward trending Cotton Creek in Gainesville, and Relyea and Stony Falls Creeks in Warsaw drain the western highlands; small streams drain the eastern highlands, and the junction of this drainage creates Oatka Creek. As the Oatka progresses north through the Wyoming Valley, several unnamed seasonal tributaries drain west and east valley walls, bringing water from the hilltops at 1900 feet elevation to 950 feet in the valley. The Oatka Creek itself falls only about five feet as it winds its way from Warsaw to Wyoming. Pearl Creek, originating in the town of Perry at an elevation of 1400 feet, joins the Oatka Creek a short distance south of the Genesee County line. White Creek drains the towns of Bethany (elevation 1020 feet) and Pavilion (elevation 910 feet). Mud Creek, rising southeast of a private pond, formerly the LeRoy Reservoir (elevation 1058 feet), drains in a northeast direction before joining Oatka Creek 2½ miles east of Buttermilk Falls at an elevation of 630 feet. 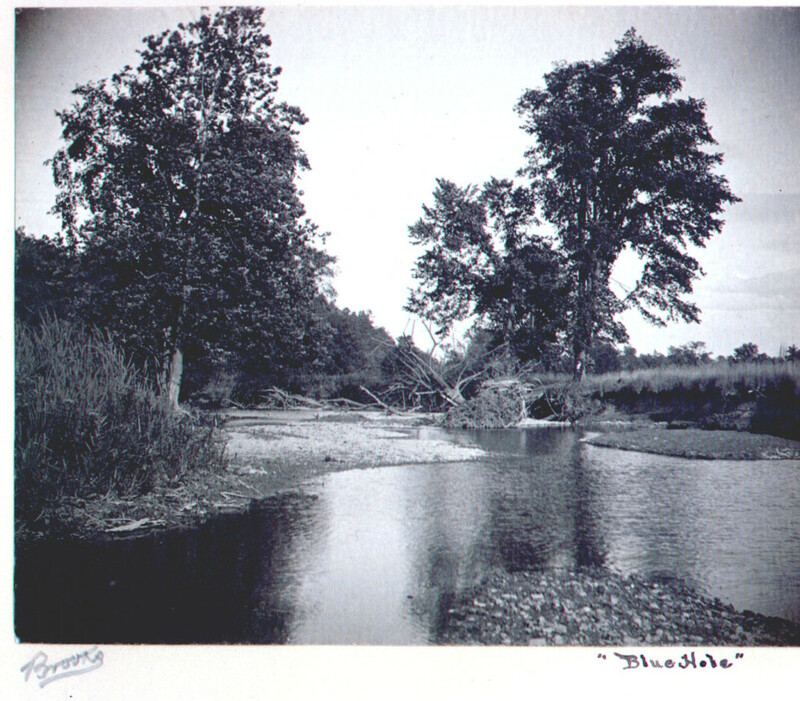 Few significant tributaries enter the Oatka between Mud Creek and the Hamlet of Mumford, where Spring Creek and some smaller limestone spring-fed streams that rise in the Onondaga limestone in Caledonia enter from the south, infusing the stream with high purity water and moderating both winter and summer water temperatures in the downstream reaches. Oatka Creek joins the Genesee River east of Scottsville at an elevation of 512 feet. For centuries prior to the Revolution, the Iroquois Confederation (Seneca, Cayuga, Onondaga, Oneida and Mohawk Nations) dominated “upstate New York.” In 1712, the Confederation “adopted” the Tuscarora Nation, and became the “six nations.” Each nation occupied a discrete area; the Oatka Creek was within Seneca Nation territory. A feature distinguishing Seneca culture was the communal “long house” where several families lived, chiefs conducted councils, and elders imposed gov¬ernance. Situated as it was on the western frontier of the Confederation, the Seneca nation became known as “Keepers of the Western Door.” Seneca Indians built and occu¬pied settlements at Avon (Canawaugus), Geneseo (Big Tree), Buffalo (Buffalo Creek), and possibly much earlier at Fort Hill north of LeRoy, a defensible position near chert and flint sources for weapons. Communications among these centers used footpaths through the forested wilderness; other paths were used for hunting and gathering purposes. The small number of Indian settlements may reflect the sparse Indian population density throughout the Oatka Creek watershed. Most Indian land claims were “extinguished” by the Treaty of Big Tree (signed 1797); Holland Land Company surveys and land sales began soon after the Treaty, and Indians went to reservations. During the Revolutionary War, the Sullivan and Clinton Expedition (1779) moved through Pennsylvania and New York State to subdue troublesome Senecas. The Expedition brought some 5,000 foot soldiers, largely New Englanders, and gave them a first-hand look at the fertile land. The idea of settlement in the Genesee country was born. In 1786, adjudication of a long-standing territorial dispute between Massachusetts and New York opened over 6 million acres west of the original Pre-emption line to settlement. The supply of land was defined. Sullivan and Clinton expedition veterans in search of a new start on new lands remembered their trek through the fertile Genesee valley; they led a growing migration from New England, New Jersey, Delaware and Pennsylvania to acquire new lands. Land speculators (e.g., Robert Morris, Oliver Phelps, Nathaniel Gorham, and James Wadsworth) traded in preemption rights, purchased land from the Indians, and initiated land office sales. Settlers arrived along the Oatka Creek somewhat in the following order. Wheatland/Scottsville – In 1786 Ebenezer Allan, probably a “squatter” ahead of other settlers on the Oatka Creek, moved 20 miles north from Mt. Morris, to the junction of the Oatka with the Genesee River. Sometimes called “Indian” Allan, he called the creek “Allan’s Creek”, a name that stuck until 1850. He soon moved again, 12 miles north to a 100-acre tract on the west side of the Genesee where he built a sawmill and gristmill (now mid-city Rochester). Peter Sheffer arrived, and may have lived in Allan’s vacated cabin in 1789-1790, on the flats where the Oatka and Genesee meet. Next came Isaac Scott, Jesse Beach and Cyrus Douglas (1790). Abraham Hanford operated a store in Scottsville and a mill on Oatka Creek; he built a scow (1817) to carry 20 barrels of wheat at a time to Rochesterville, and operated a creek-side produce warehouse. One of the notable nearby attractions is the State Fish Hatchery in Caledonia; started by Seth Green over a century ago, it continues to produce material for stocking freshwater streams and bodies of water. LeRoy – Contributing to its early start was LeRoy’s location along the major east-west Indian trail, which intersected with the Oatka Creek falls; pioneers pushed westward from Scottsville: Charles Wilbur (1793), Capt. John Ganson (1797), Hinds Chamberlain and Richard Stoddard (1801). At creek-trail intersection, the Oatka tumbled down rocky outcroppings called “Buttermilk Falls”. 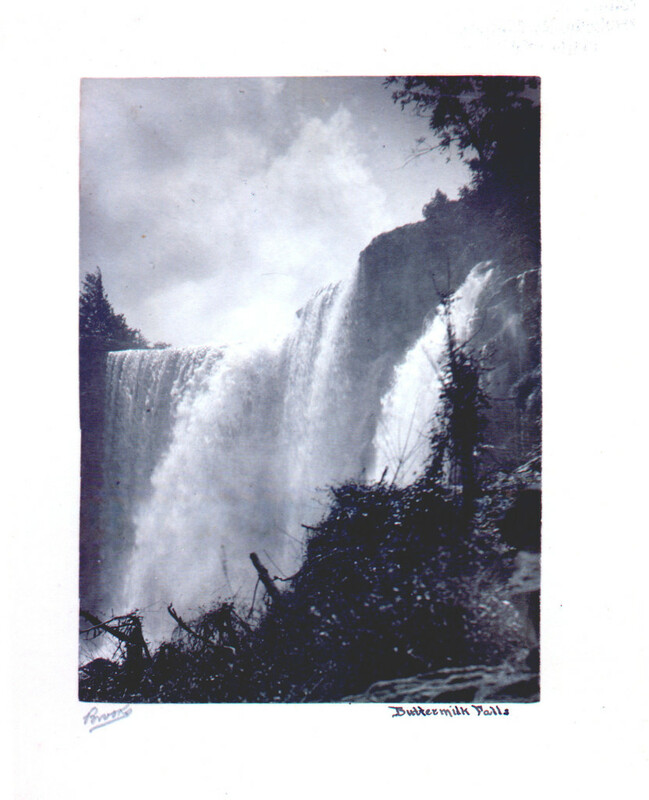 Evidently the buttermilk appearance disappeared after construction of water-powered mills at the falls, and the name, Buttermilk Falls, migrated northward to the 60-foot falls at the Onondaga escarpment shown above. Figures 5, 6, and 7 (courtesy of the LeRoy Historical Society) show local scenes along the Oatka Creek in LeRoy. The photograph on the front cover is from a private collection taken at the annual LeRoy Oatka Festival. Prior to the Civil War, the Oatka Creek became a significant link connecting LeRoy and Covington in the legendary Underground Railway. The mills on the Oatka Creek in LeRoy are gone now. More recently LeRoy is renowned as the “birthplace of Jell-O”; though the Jell-O enterprises have left LeRoy, the local LeRoy Historical Society features a Jell-O Museum. Pavilion – Isaac D. Lyon arrived in 1805, the Lawrence family and Richard Walkley in 1807, Noah Starr and Jesse Sprague in 1811, and Erastus Bailey in 1817. Of these, the Sprague family (1812) built and operated water powered mills on the Oatka, developed and operated farm land, helped populate the village of Pavilion, and produced one of its first village doctors. Midway between LeRoy and Pavilion, Erastus Bailey constructed saw and grist mills in 1817. Covington – Jairus Cruttenden arrived in Covington in 1806. Although he settled along the Oatka, he cleared land for farming along the gentle slope west of the Oatka Creek. Northward along the Oatka toward the Town of Pavilion in Genesee County, James Sprague (1812) built a water powered saw mill (1816) and grist mill (1826) at the site of Crossman Bridge (1879). 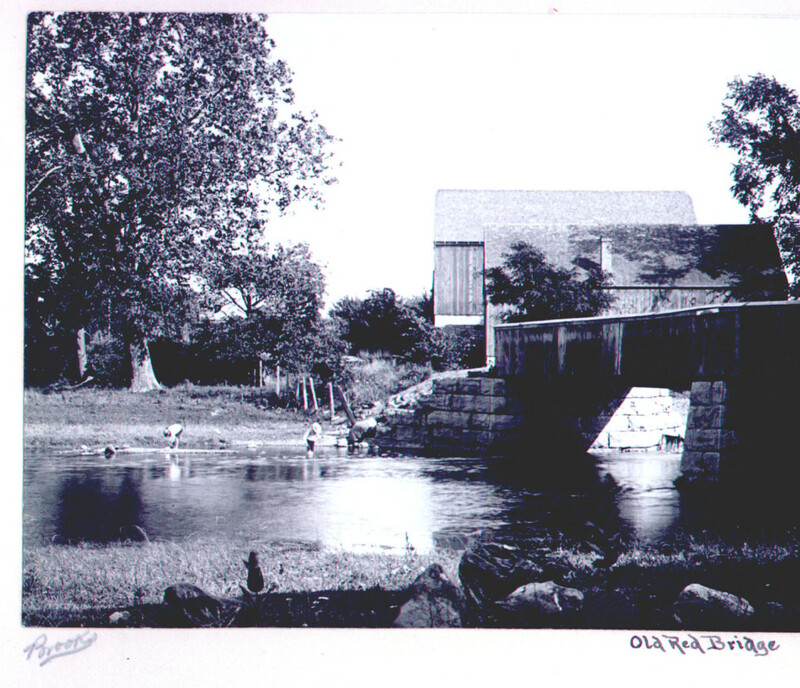 Figure 2 (courtesy of the LeRoy Historical Society) show mills at Crossman Bridge; Figure 3 is a contemporary view of this 1879 bridge. Middlebury – Settlement of Middlebury started in 1802 with the arrival of New Englanders: J. Selleck, S. Stearns, Isaac Wilson, Jabish Warren, Frederick Gilbert, Israel Dewey, Samuel Ewell, Charles Schrief, and Horace Dewey. Settlement began on high ground within the watershed several miles from the Oatka; settlers associated “swamp fever” with lowlands. In 1809, the Silas Newell family arrived on horseback from Rensselaer County, unafraid of creek valleys. He purchased 400 acres of valley bottom including land for the present village of Wyoming, a school and a cemetery. A tributary creek bed yielded clay from which bricks were made and used in constructing the Middlebury Academy (1817). The Middlebury Academy still stands nearly two centuries later, and is open to the public as the Middlebury Historical Society’s Museum. During the second half of the 19th century, interest in “oil manufacturing” led to drilling vertical wells in Towns of Middlebury and Warsaw. Salt beds were found at depths ranging from 1,000 to 1,200 feet, and this led to several commercial ventures ranging from saline spas to production of table salt. Nearly all ventures existed only briefly: marketing was fragmentary, fires were common, investment money was in short supply, and production costs were vague at best. In Middlebury, a small community known as Saltvale grew up around the evaporative salt process facility; it disappeared early in the 20th century. Several wells in Warsaw went into disuse following fires. The only known continuing facility is in Silver Springs, Town of Gainesville, which produces table salt in a vacuum evaporative process. Warsaw – Early Warsaw settlers (1803) included Elizur Webster, Jabish Warren, Daniel Curtis, Elijah Cutting, and Josiah Hovey, Jr. Elizur Webster’s original 3,000-acre purchase from the Holland Land Company straddled the Oatka Creek, and was a “large portion of the best land in the township at the lowest price.” He paid $1.50 per acre, and built a log house a “…few rods west…of the Baptist Church.” LeRoy had the nearest gristmill, 2 or 3 days distant by ox team. Newly arrived settlers purchased land from Webster. In spring 1804, the first burial, the two-year old son of Sterling Stearns, took place a half-mile south on a small knoll that became the “pioneer cemetery.” Webster built a sawmill (1805) powered by Oatka Creek water, near what is now South Warsaw. Nearby, a gristmill (1807) was completed; another gristmill (1816) was built on the Oatka north of Buffalo Street, west of Main Street. 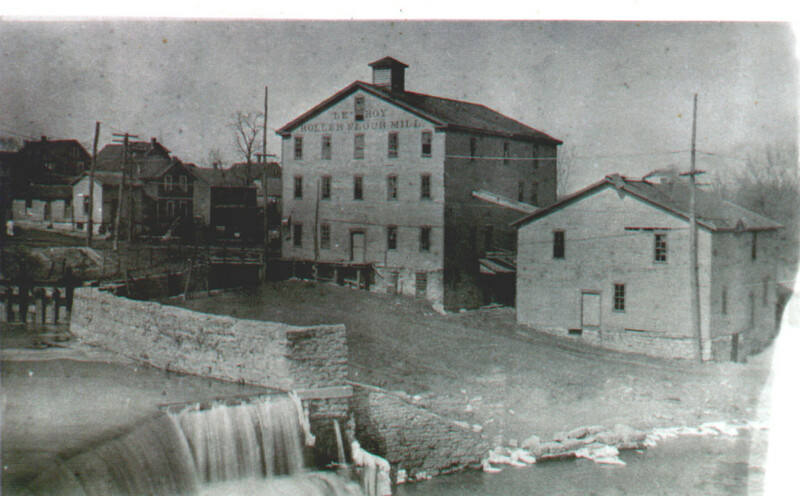 In 1833 a planing mill was built on the west side of Main St. The Oatka Creek probably powered other industries: wool carding, tanneries, machine shops, etc. The Oatka Creek was never navigable; goods were brought by wagon, from as far away as Albany, a trip of three or four weeks. Business—land sales, merchandising, and court proceedings—was conducted in Batavia, a hardship on settlers until Genesee County was divided in 1841. The town of Warsaw originally encompassed a strip 6 miles wide and 18 miles long, with its eastern boundary the transit line established by the Holland Land Company, separating it from the Ogden Tract. Middlebury (township 10) was severed from Warsaw in 1812, and Gainesville (township 8) in 1814. Noteworthy attractions in Warsaw include the Seth Gates House, home of the Warsaw Historical Society and former home of early settler Seth Gates. Gainesville – The earliest settler in Gainesville was William Bristol (1805), a surveyor who selected land on both sides of the “creek” (probably the East Koy). Two of Bristol’s brothers arrived in 1805, the same year that brought Elnathan George, James Crevath, Benjamin Morse and David Hardy. 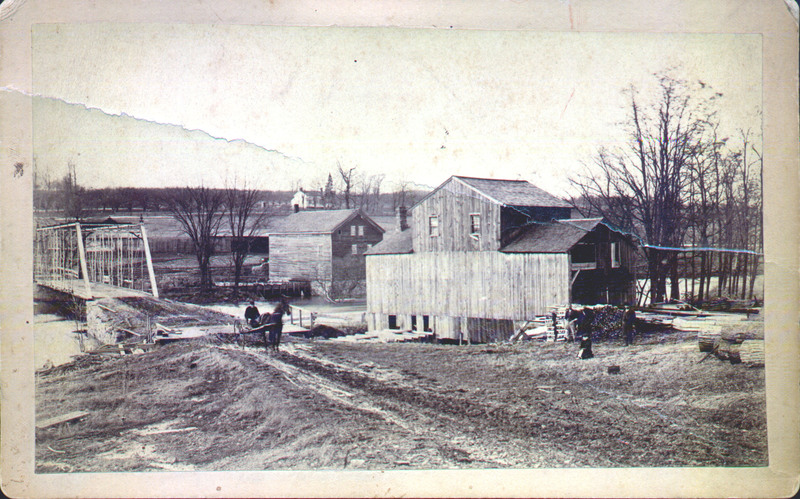 Wheelock Wood built the first sawmill in 1809, on the Oatka Creek. Tanneries, wool carding, dyeing, cloth-dressing and gristmills were built on the East Koy. Abel Moore built the first distillery in town in 1819. At the northern extremity of Gainesville, Rock Glen was the site where the Oatka provided good waterpower for an early sawmill. Only a few miles distant is the “Grand Canyon of the East”, Letchworth State Park, featuring majestic high banks on either side of the Genesee River as it flows northward toward Lake Ontario. Given to the people of New York by William Prior Letchworth early in the 20th century, the park now encompasses more than 15,000 acres and features numerous accommodations, vistas, forests, hiking trails, and overlooks. Stimulated by “Caring for Creeks,” the Oatka Creek Watershed Committee, Inc. focused attention on this Genesee River tributary as a way of advancing its mission and vision, and to perform fundamental investigations about the condition of the creek. The Committee, now a corporation operating with formal by-laws, is exempt from federal taxes under Section 501(c)(3) of the Internal Revenue Code. It maintains a web page (www.oatka.org), conducts monthly meetings, and continues to promote regaining the pristine quality of the creek. It has sponsored technical investigations that produced The State of the Basin Report (2003), Outreach Program: A Report on Phase I (2002), and The Geochemistry of Oatka Creek, New York State (2001). Committee objectives urge us to learn more about the creek, to understand creek riparian rights, to find sources of disturbance and pollution along the creek, to determine natural habitats, to coordinate local laws among towns, villages and counties, and to educate and reinstill a sense of stewardship among watershed residents. • Report water pollution violations. The Oatka Creek Committee, Inc.
or visit our website at www.oatka.org. Original publication of this Guide in 2004 was made possible by grants from the Rochester Area Community Foundation; the present revision is supported by Finger Lakes – Lake Ontario Watershed Protection Alliance (FL-LOWPA). The Oatka Creek Watershed Committee, Inc. extends its special thanks to both organizations for their encouragement and support.